In a sauce pan mix all ingredients together except for the cornstarch and bring to a boil. Remove ginger and onion from the sauce, and then set aside. Lightly season salmon with salt. In a large skillet add oil then once hot pan-sear salmon until all sides are browned, it will take roughly 1-2 minutes on each side. Place in a 200C preheated oven and cook for 15 minutes. 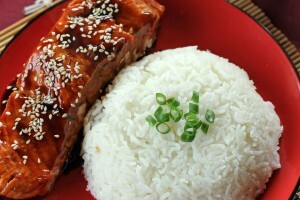 Remove from oven, pour teriyaki sauce on cooked salmon then serve with freshly steamed jasmine rice.